We've now reached a point where a clear picture of the Historical Hnefatafl has emerged. - Brandubh (cross) is the only well balanced setup for brandubh. - Saami Tablut, this setup was given directly by the Linné diary. - Tawlbwrdd (Bell), only two setups are well balanced, and the Bell appears to be the more reasonable and probable of the two. And they all appear to be the same sole game, the historical Iron Age Hnefatafl, only played on various board sizes. 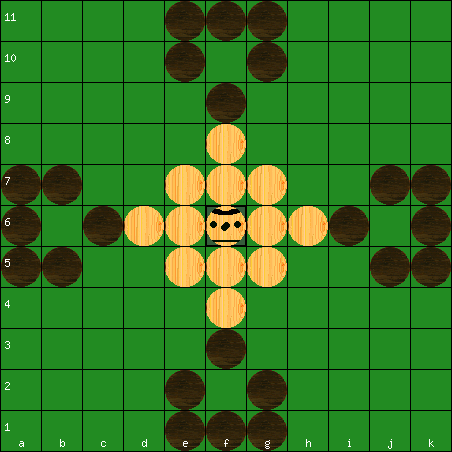 It's already today on this site the exact same rule set for all three games, the proposed Historical Hnefatafl rules, differing solely in the board sizes, plus that Brandubh plays to corner and so adds four restricted corner squares. One of these three games being the Saami Tablut, which we so carefully investigated December 2013, and which is solidly based on detailed historical description (the golden Linné diary). Because of the well documented Saami game, I believe this to be the historical rules of the Iron- and Viking Age game Hnefatafl. And also supported by the ip Ifan Tawlbwrdd diagram, the Ballinderry board, the Oslo board and the Trondheim board. This is a great resource, it seems the only thing not 100% certain for now is the layout. 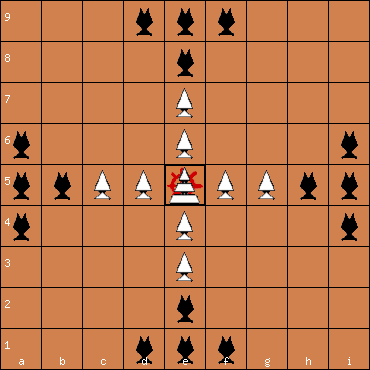 I've assumed in my games that the King could move one space from the citadel into a space surrounded by three enemies without being captured as it seems that no piece is captured in a passive way. I was wondering how others played that scenario. 10. If the king, being in his own square or castle, is encompassed on three sides by his enemies, one of them standing in each of three of the squares numbered 2, he may move away by the fourth. If one of his own people happens to be in this fourth square, and one of his enemies in number 3 next to it, the soldier thus enclosed between his king and the enemy is killed. I thought this may have been something observed by Linnaeus, maybe to prevent a sort of stalemate condition? Love the article and the Historical Hnefatafl rule set. Nice having a historical and playable set of rules. I think this instead refers to the 4 sided capture of the king when he is on the throne. In the Linnaeus diagram the squares marked 2 are the four squares adjacent to the throne so if the king was surrounded on three sides by his enemies he could move away by way of the fourth open square marked 2 as opposed to the captured against the king on his throne rule. http://www.uusikaupunki.fi/~olsalmi/Tablut.html in the Tablut thread on this forum and another site too.. I had to include the previous paragraph so that the placement of the pieces was understood. On Linnaeus' diagram, this suggests three enemies in square number 2 and an ally in the last one, when an enemy moves into square number 3 next to the ally, he is is killed between the citadel and the enemy. Oooooooooooh I thought you meant that as an alternate interpretation! my bad. 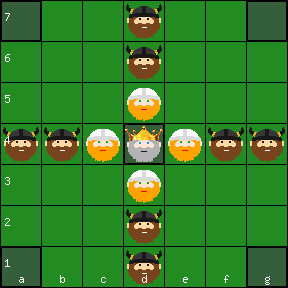 I've never seen a variant rule set with it recently however the old Hnefatafl java applet had a version of this where you could set the 'Hostile' to 'King' And anyone, even an ally to the King, could be captured against the King while he was on the Throne. It was not in the situation as described though it was just any piece between the King on the Throne and 3. But as you have put it does seem to be what that indicates. It would seem to be a particularly specific rule. I've not see the situation come up. 'Reconstructing Hnefatafl' by Damian Walker shows these are rules that were translated in the original James Edward Smith translation of Linneaus' Latin text and offers some commentary on them regarding contradiction and redundancy with other rules. Thanks again for replying, and taking the time to supply those references! Yes I've had the situation come up a couple of times, and played it as described. I'm not sure what rules most people play so was interested to see. That book looks like an interesting read so I'll give it a try! We've not used the rule 10b on this site, because this rule detail seems to be not necessary, since the defender next to the king can be captured by two attackers the ordinary way. Thanks for the reply Hagbard. That's interesting that you have chosen to ignore it but I guess it really only speeds up the game a bit for the attackers anyway, so doesn't really detract from the fundamentals of the game.